This is the last of the "Rattlesnake" series of Klamath figures, obtained by Mr. John L. Cox, from Emma Jackson of Oregon. 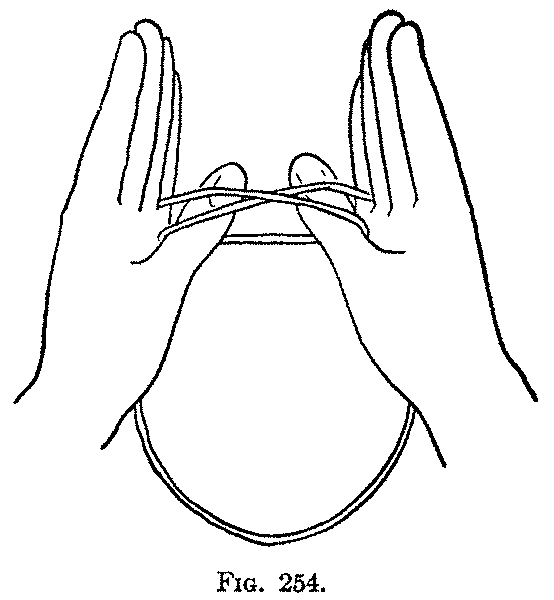 First: Hold the string between the tips of the thumb and index of each hand, so that a short piece passes between the hands and a long loop hangs down. Make a small ring, hanging down in the short string, putting the right hand string away from you over the left hand string. Put both thumbs away from you through the small loop and both little fingers away from you through the long hanging loop (Fig. 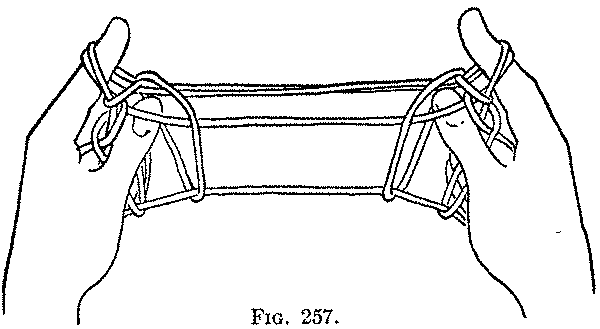 254), and separate the hands (Fig. 255). Second: Now go through all the movements of the "Two Foxes" including Opening A, to the very end. Remember that you have two near thumb strings; these must be considered throughout as one string (Fig. 256). The heads of the "Squirrels" are directed toward the hands; the tails are the loops on the index fingers. The pattern should be held vertically. To hang up the "Squirrels," pick up on each thumb the straight string crossing the figure (Fig. 257). 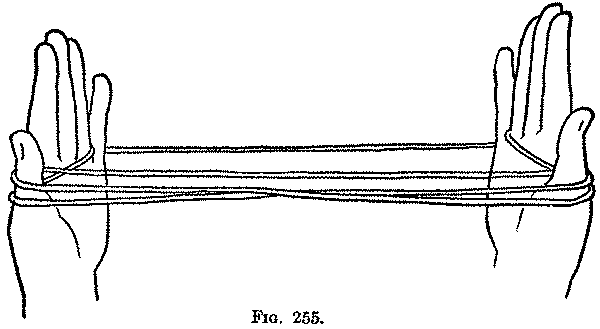 Release the index loops and separate the hands (Fig. 258). The opening movements are interesting modifications of Opening A, and occur, so far as I know, in no other figure.